The blanket pattern shows the territory where those pillars spoil the view. Those twin pillars used to hold up a bridge across the Willamette River from the north end of Calapooia Street. (A photo in one of the late Bob Potts’ “Remembering When” books shows it in 1910 and calls it the old Steel Bridge.) That crossing looked pretty spindly in the old photos and was dismantled eons ago, probably when the Ellsworth Street Bridge was built about 1925. Now the remaining support structures, in the park as well as in the middle of the river and on the other side, hold up high-tension electric lines. Monteith Riverpark was built around those obstructions in what had been an industrial and warehouse area. 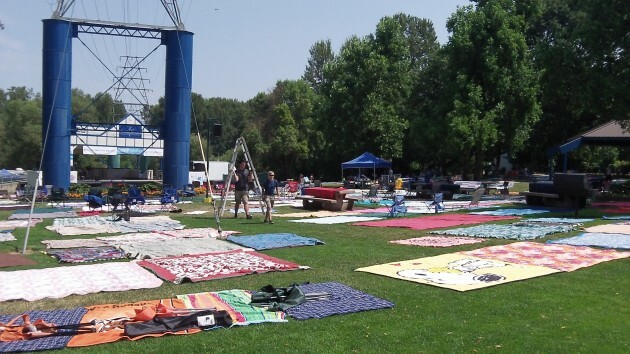 The pillars are not actually in the way except during events, when they partially block the view of the stage from a swath of lawn down the middle of the park, as illustrated by the pattern of blankets in place at mid-day Thursday in advance of River Rhythms. How interesting! I never knew, thought they were just another of those strange bits that manage to make downtown Albany more interesting than downtown Corvallis, especially comparing the waterfronts. Maybe I’d think differently if I actually lived in Albany instead of just riding my bike there once in a while. How about moving the stage and using the piers for a pedestrian path across the river? Interesting. I did not know the piers the PP&L towers were set on were from an old bridge. I just figured the towers were set on those because of being near the river and flooding. Thanks Hasso.